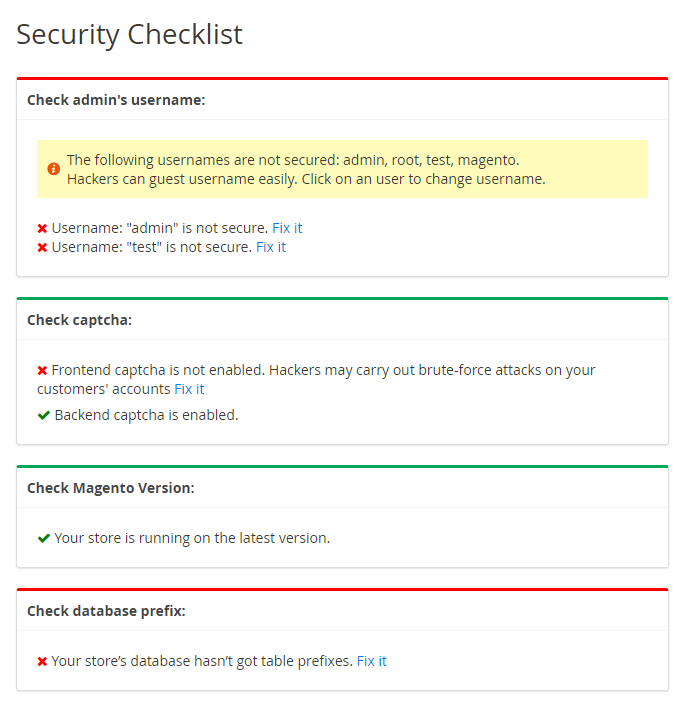 Security issues for Magento have left a big question mark in the community of online stores. This problem is specially cared when Magento-based stores which own critical information and huge transactional volume can easily become ideal prey for blackhat hackers to attack. 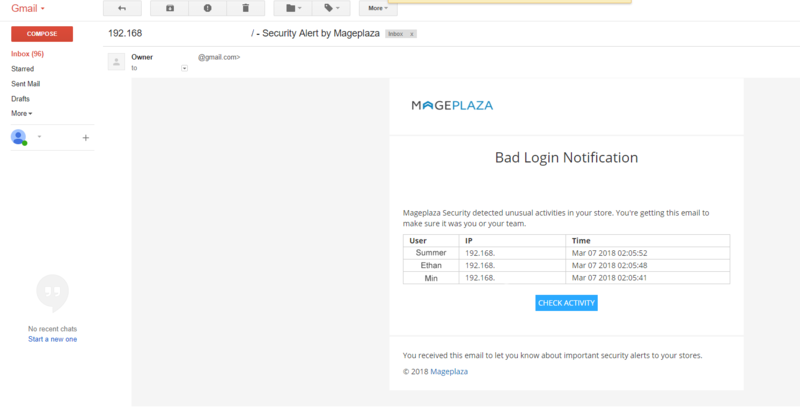 To help online stores prevent brutal break-ins, Mageplaza has developed the Security extension. Magento 2 Security extension gives store owners the ability to detect the IP addresses that are intentionally attacking their store at any given time. Therefore, they have timely measures to prevent this issue such as blocking those IP addresses or sending warning emails to store owners. You can review login records from the dashboard when entering the backend. 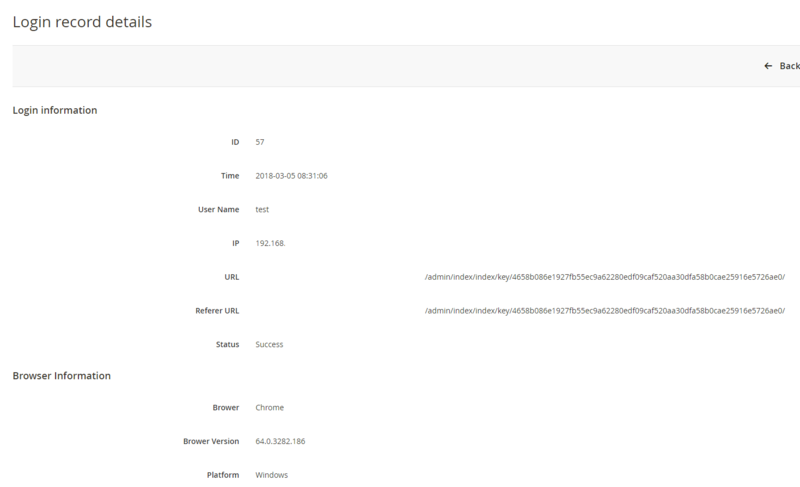 The log displays the newest 5 logins and you can click on the login name to view the details. In the Enable field: Choose “Yes” to turn the Security module on. Enter the email address to be able to receive warning emails. In the Enable field: Choose “Yes” to enable this function. 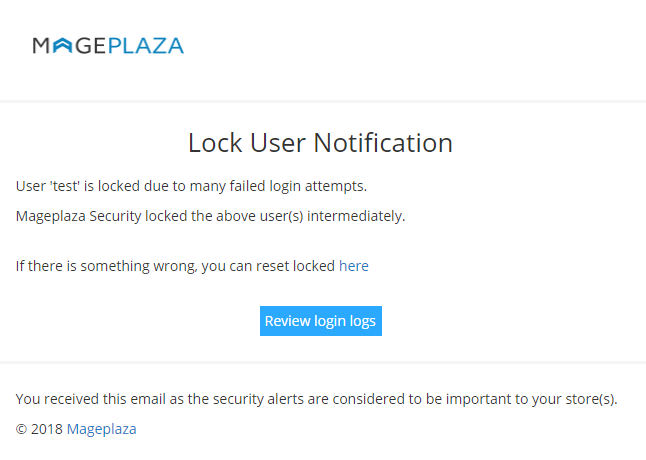 Enter an allowable number of failed logins. Default number of maximum failed login attempts is 5 when you enable Security module. If you leave it blank or enter 0, after a failed login happens, an email will be sent. Enter the number of minute(s) which presents the length of a session. During this session, If the Maximum number of failed login attempts is reached, warning emails will be sent. Default number of allowed duration is 10 minutes when you enable Security module. If you leave the field blank or enter 0, no warning emails will be sent even if the maximum number of acceptable logins is reached. In the Locked User Alert field: Select “Yes” to send the alert email when the admin account is locked due to failed login attempts is exceeded. Choose the template for the warning email. You can edit/customize one at Marketing > Email Template. All IP addresses filled in this section will be blocked whenever accessing the admin login page. You are able to block one IP address, multiple IP addresses, an IP address range or multiple IP address ranges. IP addresses are separated with commas ,. All IP addresses that are filled in this section will be allowed whenever accessing the admin login page. You can allow one IP address, multiple IP addresses, an IP address range or multiple IP address ranges. IP addresses are separated with commas ,. Blacklist(s) has higher priority than Whitelist(s) which means if a IP address is in the Blacklist, it will be blocked even it's in the Whitelist as well. So please make sure that you add your IP address in the Whitelist only. In the Check admin’s username box: Check the name of the admin account, if the default name is too obvious to guess or popular to name, the message will alert the store owner. Check if captcha is enabled outside the frontend or in the backend. Notify if store owner has enabled captcha. If not, message will warn store owner to enable captcha. 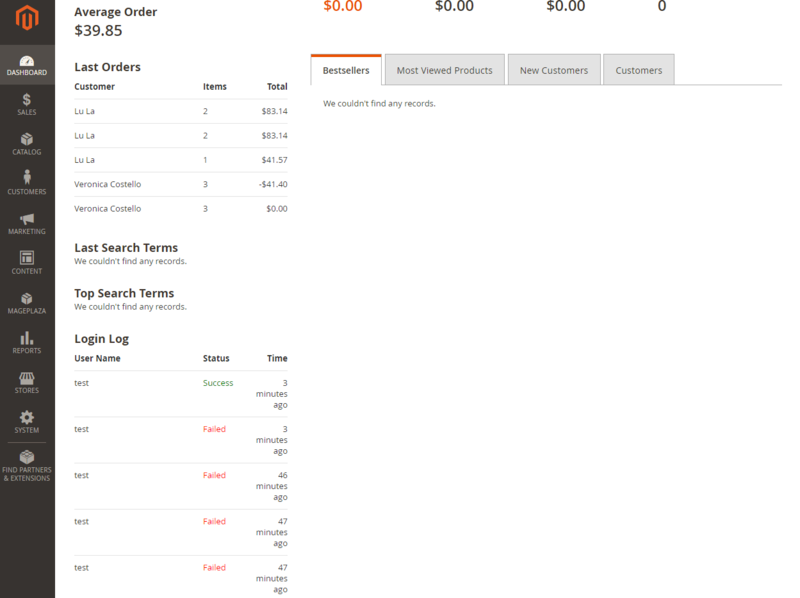 In the Check Magento Version box: Check the version of Magento that the store owner is using. If this is not the latest version, the checklist will alert store owners to update to the latest version. Check if the store owner has used the database prefix or not. If not, the checklist will alert store owners to use them for database security. If the store owner uses a database prefix, the checklist will notify them that their database is working properly. For possible low-key factors that are not good for your security, they will be marked a red X. We'd highly recommend you should upgrade Security module to Professional edition to learn the detail way how to fix it throughoutly. 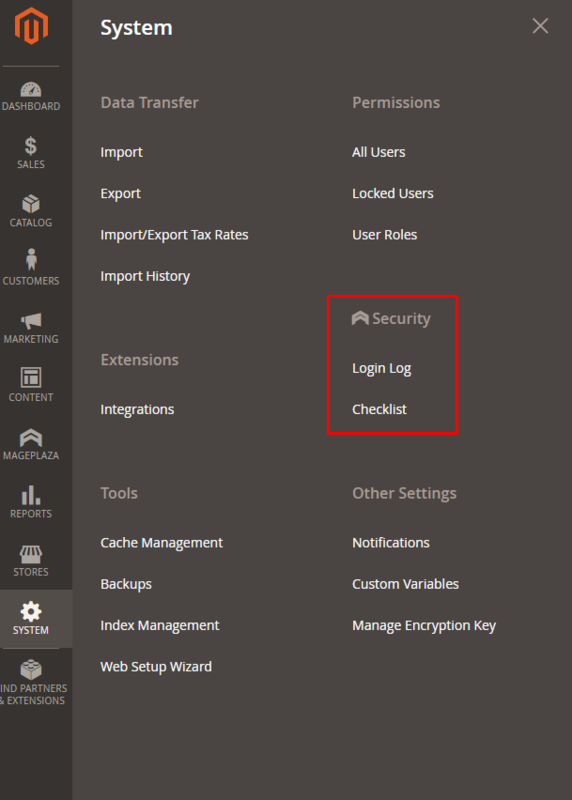 From the admin panel, make your way to System > Security > Login Log. All logins and login attempts will be recorded here. Once an admin account has exceeded the allowed login attempts (which is configured at Store> Settings> Configuration> Advanced> Maximum Login Failures to Lockout Account), there will be a mail notification to the store owner that this account has been lock up. Store owner should review this case again to reset safety settings. You can refer this article to learn how to unlock an admin user account. The Last login column records the newest recent login attempt of an admin. The IP Address column records the IP address corresponding to the newest recent login attempt of an admin. Clicking on an IP address, it will redirect to the Traceip page. After you have finished running those above command lines which reset the Blacklist(s) field, you will be able to access the admin page again. Note that the Blacklist(s) field is reset now so don’t forget to reenter the blacklist IPs. If you run the command bin/magento security:reset, both Blacklist(s) and Whitelist(s) will be reset.